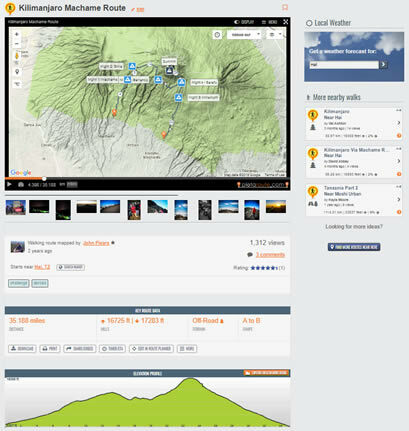 This page now shows the route's elevation profile separately from the map, so you can see the hills at a glance. If you a viewing one of your own routes, any tags you assigned to the route will be shown. You can click on a tag to show all your routes with that tag. We've changed the weather widget in the sidebar to make it more user friendly, with the option to search for alternative locations. We've added some relevant tips to this page from our Tips and Tricks section. We hope you'll find these changes useful and look forward to bringing you news of further developments in the pipeline. Is Plotaroute able to offer OS 1:25 or 1:50 in the map layer options? I suspect this is a licensing issue and would probably be a 'premium' function, however, it would allow even more accurate plotting of routes as Google maps are very limited. Viewranger has this as a pay for view credit system and is currently my prefered option (other than paper maps of course) for digital route planning. Hi Trevor - we've actually aproached Ordnance Survey about this, but they won't allow use of their maps in a Google application like our, due to copyright concerns they have linked to Google's Term of Use. The only other alternative would be for us to develop a completely separate application for Orandance Surbey maps, which is not really viable, so I don't think we're going to be able to offer this, in the short term at least. Hi John - Thanks for the reply. I thought that would be the case. To be fair, I use both Plotaroute and Viewranger equally for different uses, particularly Viewranger's app for checking grid and route position on my mobile. I have just (today) finished full potting of my routes for this year's TGO Challenge - a coast to coast walk across Scotland. What I love about Plotaroute is the time/distance function and the detailed ascent/decent and hight gain info and the ability to click between miles and kilometres - invaluable when submitting routes for vetting by the organisers. Thanks for this feedback Trevor, it's always good to hear which features people are finding useful. As it happens, I'm planning a similar challenge this summer myself - Wainright's coast to coast walk across England! I wish you all the best with your one.